Support the Flemingdon Park Rent Strike! What follows is a call to support the Flemingdon Park rent strike, yet another rent strike popping off in so-called Ontario in Canada. On August 1st more than 200 tenants at 31-35 St. Dennis Drive will withhold their rent. Rent strikers demand Minto Properties withdraws its application to raise rent above the guideline. Despite serious and persistent disrepair in the building, Minto wants to raise tenants’ rent by $180 over three years. This would mean that every month Minto would take $70,000 more in rents from the pockets of tenants in the building. Minto bought the building 31-35 St. Dennis Drive last year. The company anticipates rising rents in the area with the arrival of the Eglinton Crosstown LRT. The landlord is now beginning to price out working class and immigrant tenants, renovate units, and raise rents even higher. The building is owned by Roger Greenberg, one of Canada’s richest 100 people in 2018. 31-35 St. Dennis is home to many immigrant families. More than half the residents are Roma people from Slovakia and the Czech Republic. Roma people who are new to the country after having fled persecution at home are once more being threatened with displacement. I’m calling to demand that Minto immediately withdraw its application to raise rent above the guideline at 31-35 St. Dennis. Should you choose to ignore tenants’ demands, you will face further action from tenants and community members who support them. I am writing in support of rent strikers at 31-35 St. Dennis Drive. I demand Minto immediately withdraw its application to raise rent above the guideline at 31-35 St. Dennis. Minto’s bid to price working class and immigrant tenants out of their homes will not go unopposed. Should you ignore your tenants’ demands you will face further action against your company by tenants and we community members who support them. The Flemingdon Park rent strikers are not only up against their predatory landlord, Minto Properties; they will also have to contend with Landlord and Tenant Board. Far from a fair and even arbiter of landlord-tenant disputes, the Board is a veritable eviction factory – 90% of the Orders it makes each year are for vacant possession of tenants’ homes. 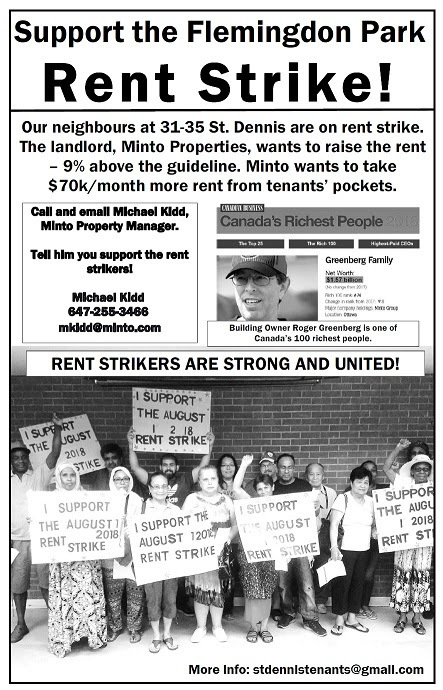 If Minto drags hundreds of rent strikers to the Board, they will need a defense fund. The Board may require each rent striker to pay Minto’s eviction application filing fee of $190. It is the Board’s practice to apply these fees as a punitive measure against tenants. For information on how you can donate please contact stdennistenants@gmail.com. A donation of $190 sponsors one rent striker, ensuring they have their eviction fee covered going forward. If you’re a union member or a member of another organization interested in making a larger donation.